Calling all shopaholics, style mavens and celeb spotters! Don’t leave town without a stroll down the Sunset Strip, where you can score cutting-edge clothes, unique accessories and awesome gifts. Who knows? You might even bump into an entertainment A-lister. Molly Brown’s has been curating designer swimwear, dresses, cover-ups and other apparel for more than 30 years, earning a golden reputation for selection and service. Beach Riot, Lady Lux, Mikoh, Tigerlily and Vix are some of the offerings. Stop in, suit up and head to Zuma Beach! Shop TAGS and explore fashion guru Jackie Rose’s line of simple, comfortable, well-made pieces that will take you everywhere you want to go. She knows how to pack, too, having spent decades globe-trotting with her husband and four children. Being a part-time couch potato isn’t a bad thing as long as you look good while lounging. Wildfox is all about comfy with attitude. You might choose a Currently Sleeping plush robe, perhaps, or a Textrovert Johnny Ringer vintage- inspired T-shirt. Westime describes itself as Southern California’s ultimate destination for extraordinary watches, carrying more than 50 Swiss brands. Fred Segal has been defining laidback LA chic for more than 50 years. His denim designs were an instant hit – selling for $19.95 when jeans were typically $3. Today, the flagship space on Sunset is 13,000 square feet and features shops-within-a-shop, a pop up and event space, a cafe and florist. Designers range from Alexis and Amanda Bond to Tanya Taylor and Unfortunate Portrait. There’s also a beauty/fragrance area. Head downstairs and check out KITH, which boasts a stellar selection of apparel and footwear. Other stores with an eclectic assortment of designers are Kin and H. Lorenzo. Check out Zadig & Voltaire for French flair. At H&M, haute couture meets the mass market – making it easy to refresh your look and still keep some cash in your pocket. Most of the stores we’ve mentioned sell clothes for women and men. But if you need something more guy-centric, Hugo Boss is a good bet. Or spiff up with a cut or a shave at Like A Gentleman Barbershop and stock up on Baxter of California, Byrd, Caputo’s Hair and Layrite products. Or try on sleek specs from New York-based Warby Parker at the Standard Hotel. For every pair of glasses sold, a pair goes to someone in need. Browse “books, vinyl and objet d’art,” as the store’s sign reads, at Book Soup, the longtime literary anchor of Sunset Strip. Exxhibit at the Mondrian Hotel is decidedly not a gift store – no tacky tanks and gag gifts here. You’ll find Herschel luggage, jewelry, clothes, hats and more. If tacky tanks and gag gifts are, in fact, your thing, we won’t judge. We’ll just tell you not to miss Aahs, jam-packed with clothes, costumes, toys, balloons, novelty items and tons of seasonal decorations. Fancy some Vivienne Westwood? Want some Union Jack joy? 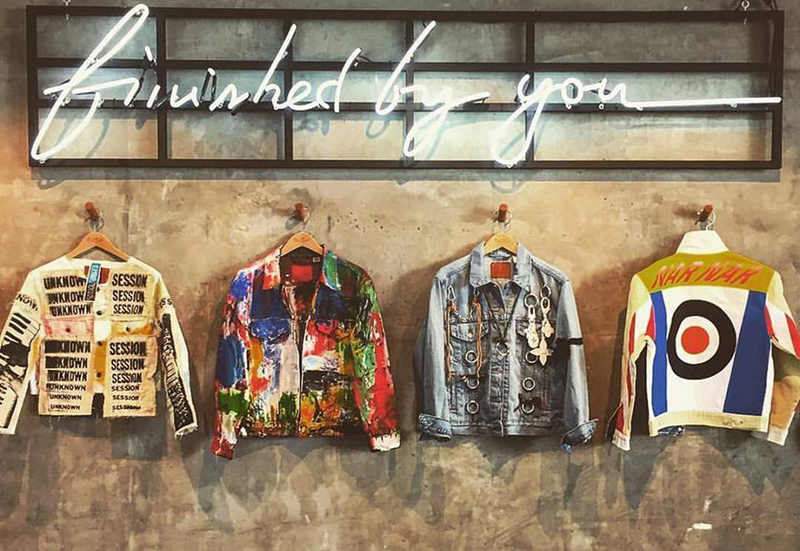 The Alex Roldan Boutique at the London West Hollywood Hotel won’t let you down. Dan Deutsch sunnies and Peepers reading glasses are customer favorites along with candles, fragrance, frames, jewelry, glassware and watches. And in case you’re really unlucky with California weather: rain hats.